By Kwame R. Charles, PhD. How do you tell the people who hired you to find the problem and recommend a solution, that they are the problem – or at least, a large part of it, and, therefore, a large part of the solution? This is the dilemma that some of us face as management consultants: how to speak truth to power – and still get paid. Several regional commentators have identified the challenges of leadership and management in the Caribbean business space. In a 2015 article entitled “Caribbean Business Leadership,” management consultant and university lecturer, Dr. Julian Ferdinand of St. Vincent, laments the negative perception Caribbean workers have of their managers, and suggests that the managers need to change how they manage. He quotes Professor Betty Jane Punnett, formerly of the University of the West Indies, speaking about businesses in the Eastern Caribbean needing to put the obsolete management practices of the colonial and plantation past behind them, and developing and implementing appropriate modern management approaches that focus on exploiting international opportunities for competitive advantage. For the past 17 years, we at Quality Consultants Limited have been conducting employee surveys in organizations throughout the English- and Dutch-speaking Caribbean, and the findings are consistent: employees identify poor leadership and management practices as the main obstacle to improving their engagement and productivity levels. You get the impression that employees think their organization would be a better place – if it wasn’t for their managers. We’ve surveyed over 100,000 employees – many of them several times – from more than 100 organizations in the region, on their managers’ leadership and management styles and practices, management/employee relations, people management practices, organizational strategy, internal communication, work systems and processes, and customer focus, among other areas. The objectives of these surveys are to assess employees’ engagement and satisfaction with their work and their organization, and to give management feedback on matters that could be affecting their employees’ job performance and productivity, and, therefore, their organization’s performance. After almost two decades of research, the results are startlingly consistent: overall employee satisfaction and engagement hover just above 50%, suggesting that just over one out of two employees in our organizations are happy with their organizations and management. Specifically, employees invariably give their senior management, people management practices, internal communication and management/employee relations failing grades. Although the numbers may vary from organization to organization, and from year to year, the configuration tends to remain the same. Perhaps most troubling is employees’ assessment of their managers. In a series of surveys spanning three years, with over 7,000 employees from more than 50 organizations, only one in five (20%) said their senior management builds trust by keeping their promises and admitting mistakes. Fifty percent said they don’t. Almost a third (30%) said they believe what their senior management says, while close to 40% said they don’t. Only a third (34%) said they have confidence in their senior management’s decision-making, and only two in five (40%) think their senior management provides good leadership for their organization. These are not good findings for Caribbean business leadership and management. When it comes to management’s treatment of employees, the results aren’t any better. Only 36% think their managers treat employees fairly and ethically. Almost 40% think otherwise. And just a little more (41%) say their managers treat them with respect. A third don’t think so. On the other hand, just over half of the respondents in these surveys (57%) say they respect their managers. There appears to be a clear disconnect between management and employees in our regional organizations. This is further evidenced by the vastly different perception that managers and employee have of their organizations. Invariably, managers’ perception of their organization is much more rosy than employees’ perception, and the lower down the organizational hierarchy you go, they wider that perceptual gap. Vestiges of our colonial past? Poor manager selection? Inadequate leadership training and development? Or is it just sour grapes on the part of employees? Is it that employees just don’t get it – management, that is? Or is it that our managers don’t get it? Can over 100,000 employees, or even 7,000, be so wrong? Or is management the problem, or, at least, a major part of the problem? And if the latter, how do we tell them? And how do we get them to change? If managers want to maximize their employees’ potential, if they want to attract and retain talent, if they want to engage employees to increase productivity and competitiveness, they will need to make changes in how they manage their people. To help them make the necessary changes, I suggest the management consultant employ some practices from grief counselling. Here’s an example of a grief management model that can be used to help managers to come to terms with the reality of their situation and make the necessary changes. It’s called the SARA model. Shock: When managers first get our survey results, invariably, they are surprised, especially as they have a different view of the organization from their employees. Often, their first reaction is to shoot the messenger: the sample was too small, it’s not representative of all employees, they didn’t understand the questions. 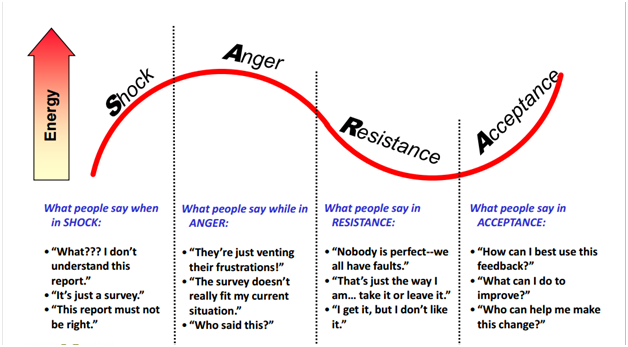 Resistance: Anger turns into resistance, because the managers begin to realize that they are part of the problem, and that they need to change if they are to improve the situation. And change is difficult, especially when you are the one who has to change. Acceptance: Eventually, with coaching and counselling, managers come to understand and accept their employees’ feedback, and resolve to make the necessary changes. This is not an easy process to go through, and requires patience on both sides. It also requires presenting managers with options, possible solutions. We use regional and international best practices to help managers change. These include managing managers’ expectations even before the survey is conducted, by preparing them for possible bad news, especially if it’s the first time that they’re conducting an employee survey. When they get the results, we advise them to accept them as a gift from their employees, in the same way they would accept feedback from their external customers. It is an opportunity to improve. We suggest that they look for “low-hanging fruit” or “quick wins” that can be addressed with minimum effort but with maximum effect. One of these is often improving communication, as communication usually scores low in our surveys. We recommend regular town hall meetings with all staff to update them on company matters, strategy, organizational successes and failures, and employee issues; and to give employees an opportunity to give their feedback on these matters. So how do we tell our client that they may be the problem they’re paying us to help them solve? There is a wealth of business literature and research that links employee attitudes, perceptions and engagement to a range of bottom line outcomes, including profit, shareholder value, customer satisfaction, talent retention, and operational efficiency. These are the outcomes business leaders and managers understand and focus on, and these are the dots we have to connect for them, using the appropriate linkage models and analytics. When our leaders and managers – both public and private – begin to adopt more contemporary approaches to leading and managing that recognize people as the source of creativity, innovation and value-creation, our productivity will increase and so will our global competitiveness. Management consultants can help them get there. Julian Ferdinand, Caribbean Business Leadership, The Vincentian, August 2015. Jack Preston, “What’s the State of Leadership in the Caribbean?” 24 April 2017. https://www.virgin.com/entrepreneur/whats-state-leadership-caribbean. Accessed May 29, 2017. Jack Preston, “Gervaise Warner – What I’ve Learnt as a Leader.” 26 May 2017. https://www.virgin.com/entrepreneur/gervase-warner-what-ive-learnt-leader. Accessed May 29, 2017.